"I haven't paid much attention to my peers' work in 20 years," Jeff Hornbaker told me this week. How can you be at the top of your game if you don't even know what the top of your game looks like right now? ... If you don't even know what your peers are doing? As he explained what he meant, it made perfect sense... I think he has it exactly right. In the 1970s, Jeff had a vision of what he wanted to accomplish. He became among the best in the world at it (if not THE best), still to this day. The important thing here is, Jeff didn't want the work of his peers to influence or cloud his vision. So he made a conscious effort to "STOP listening." When you are just starting out in something, you need to listen to everyone and pick up on everything. It is a wonderful time of discovery... You are new. You are green. You know nothing. You have to take in as many influences as you can, and you have to learn from everyone that has something to share. Hopefully with your mastery, you'll have a unique vision. And you won't want to see that extraordinary vision diluted down to being just ordinary. Jeff's simple idea of "not listening" to his peers is one way of staying "extra-ordinary." I think this idea of NOT listening applies to me in many ways. Two simple places you can see it in me are in my investing and in my guitar playing. The guitar playing might be the easiest example... When people hear that I play the guitar, they ask the usual questions... "What style of music do you play? Who's your favorite artist?" Like Jeff, I have a vision for what I do, and I've spent many years perfecting it. I think it's original and unique. And these days, I don't listen to other artists for inspiration. First, a song you might know. Then, a demo track of mine. ...with an explanation of what's happening here. Like Jeff Hornbaker, I have put my time into my art. I listened intensely to others for many years. I honed my craft. Now it's time to NOT listen, and for me to do my own thing. I don't want my music to conform to what's popular today. I want it to be unique and hopefully exceptional, not ordinary. I've put my time in... I have all the education (through a PhD) and all the experience (literally decades of traveling the world looking at investing ideas, working for hedge funds, investing successfully for myself, etc.). I listened and soaked up knowledge for years. Now, I'd rather NOT listen to my investing peers. It took me a long time to fully accept that my investing ideas (on my own) were actually the best investing ideas for me... that I was better off going with 100% my own ideas than diluting them with other people's ideas. I made more money for myself, and my subscribers, when I did my own thing. I am better off "hiding out" in my tiny office in a tiny Florida town, doing my own investing research, where I can do my own unique thing. I would be worse off on Wall Street, with hundreds of peers, where you all end up with an unexceptional situation that some people call "groupthink." When everyone is doing the same thing, there's hardly any chance of doing something exceptional. By "hiding out" in Florida – and therefore NOT listening to my peers on Wall Street – I think I have a better chance at thinking my own thoughts... and at doing something exceptional for you. A lot of life is about compromises. And you do need to listen a lot to master something. But once you master something, and once you have your own unique vision, then you ought to consider NOT listening so much anymore... Seriously. It will allow your vision to not get diluted, to stay pure (and hopefully exceptional). I've believed this is true... but I've never been able or willing to put it into words before. "Cocktail parties are where I learn where NOT to invest right now," Steve writes. "They're the perfect 'contrary' indicator." In short, Steve says you can take whatever investment idea everyone is talking about and almost guarantee it'll be substantially lower in five years. Get the whole story here. For years, Steve has used the idea of judging investor sentiment to help make huge, safe returns for his subscribers. You can learn more about judging investor sentiment in this interview with Steve. Exchange-traded funds, or ETFs, were created in the early 1990s to provide investors with "instant diversification." Most ETFs track indexes (like the S&P 500) or commodities (like gold)... And because many are not actively managed, they do this with low fees. A good ETF can be a big help to individual investors. But not all ETFs work as advertised. Take the popular U.S. Natural Gas Fund (UNG), for instance. It's supposed to track the price performance of natural gas, but its flawed structure makes it "bleed" value from shareholder accounts. It's one of our candidates for "the world's worst ETF." You can see this dynamic at work below. 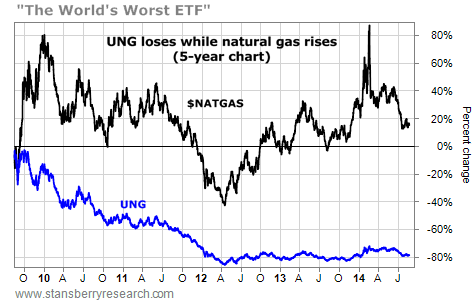 Our chart plots the performance of natural gas (black line) and UNG (blue line) over the past five years. Natural gas is up nearly 20%. But UNG is down more than 75%. Just because an ETF says it tracks an index or commodity, doesn't mean it will. "If you haven't heard of Meb Faber, you will," I told my True Wealth readers awhile back. Meb simply has too many good ideas.